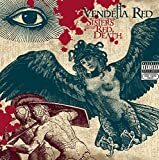 Sisters of the Red Death is a huntingly brilliant tale of betrayal, stripped innocence, and hatered. Through the course of this 12 song epic you'll want to "Shiver," cry "Gloria," "Run," and then bask in "A Joyless Euphoria." Zach Davidson's beautifully wavering falsetto along with Burke Thomas Overdrive's machine gun drumming, Justin Cronk and Erik Chapman's razor cutting guitar, and the heartbeat thump of Michael Vermillion's bass compliment each songs lyrics perfectly. By the end of the record you won't know whether to cry out of fear or joy that torture of the poor soul who has endured this pain is hopefully over.